"Kingdom of Judea" redirects here. For the Judean polity of the 1st and 2nd centuries BCE, see Hasmonean dynasty. Judea is a term used for the mountainous southern part of the historic Land of Israel. The Kingdom of Judah (Hebrew: מַמְלֶכֶת יְהוּדָה Mamléḵeṯ Yehudāh; Akkadian: 𒅀𒌑𒁕𒀀𒀀 Ya'uda; Aramaic: 𐤁‬𐤉‬𐤕‬𐤃𐤅‬𐤃‎ Bēyt Dāwīḏ) was an Iron Age kingdom of the Southern Levant. The Hebrew Bible depicts it as the successor to the United Monarchy, a term denoting the Kingdom of Israel under biblical kings Saul, David and Solomon and covering the territory of two historical kingdoms, Judah and Israel; however, historians are divided about the veracity of this account. For the parallel history of the southern Kingdom of Judah and its northern neighbour, the Kingdom of Israel, see History of ancient Israel and Judah. In the 10th and early 9th centuries BCE, the territory of Judah appears to have been sparsely populated, limited to small rural settlements, most of them unfortified. Jerusalem, the kingdom's capital, likely did not emerge as a significant administrative center until the end of the 8th century; before this the archaeological evidence suggests its population was too small to sustain a viable kingdom. In the 7th century its population increased greatly, prospering under Assyrian vassalage (despite Hezekiah's revolt against the Assyrian king Sennacherib), but in 605 the Assyrian Empire was defeated, and the ensuing competition between the Twenty-sixth Dynasty of Egypt and the Neo-Babylonian Empire for control of the Eastern Mediterranean led to the destruction of the kingdom in a series of campaigns between 597 and 582, the deportation of the elite of the community, and the incorporation of Judah into a province of the Neo-Babylonian Empire. The legendary history of David and Solomon in the 10th century BCE tells little about the origins of Judah. There is no archaeological evidence of an extensive, powerful Kingdom of Judah before the late 8th century BCE; Nimrud Tablet K.3751, dated c. 733 BCE, is the earliest known record of the name Judah (written in Assyrian cuneiform as Yaudaya or KUR.ia-ú-da-a-a). Prior to this the kingdom was no more than a small tribal entity which was limited to Jerusalem and its immediate surroundings. The status of Jerusalem in the 10th century BCE is a major subject of debate. The oldest part of Jerusalem and its original urban core is the City of David, which does not show evidence of significant Israelite residential activity until the 9th century. However, unique administrative structures such as the Stepped Stone Structure and the Large Stone Structure, which originally formed one structure, contain material culture dated to Iron I. On account of the apparent lack of settlement activity in the 10th century BCE, Israel Finkelstein argues that Jerusalem in that century was a small country village in the Judean hills, not a national capital, and Ussishkin argues that the city was entirely uninhabited. Amihai Mazar contends that if the Iron I/Iron IIa dating of administrative structures in the City of David are correct, (as he believes) "Jerusalem was a rather small town with a mighty citadel, which could have been a center of a substantial regional polity." A collection of military orders found in the ruins of a military fortress in the Negev dating to the period of the Kingdom of Judah indicates widespread literacy, given that based on the inscriptions, the ability to read and write extended throughout the chain of command, from commanders to petty officers. According to Professor Eliezer Piasetsky, who participated in analyzing the texts, "Literacy existed at all levels of the administrative, military and priestly systems of Judah. Reading and writing were not limited to a tiny elite." This indicates the presence of a substantial educational infrastructure in Judah at the time. 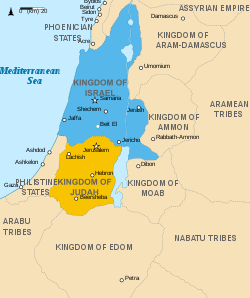 According to the Hebrew Bible, the kingdom of Judah resulted from the break-up of the United Kingdom of Israel (1020 to about 930 BCE) after the northern tribes refused to accept Rehoboam, the son of Solomon, as their king. At first, only the tribe of Judah remained loyal to the house of David, but soon after the tribe of Benjamin joined Judah. The two kingdoms, Judah in the south and Israel in the north, coexisted uneasily after the split until the destruction of the Kingdom of Israel by Assyria in c. 722/721. The major theme of the Hebrew Bible's narrative is the loyalty of Judah, and especially its kings, to Yahweh, which it states is the God of Israel. Accordingly, all the kings of Israel and almost all the kings of Judah were "bad", which in terms of Biblical narrative means that they failed to enforce monotheism. Of the "good" kings, Hezekiah (727–698 BCE) is noted for his efforts at stamping out idolatry (in this case, the worship of Baal and Asherah, among other traditional Near Eastern divinities), but his successors, Manasseh of Judah (698–642 BCE) and Amon (642–640 BCE), revived idolatry, drawing down on the kingdom the anger of Yahweh. King Josiah (640–609 BCE) returned to the worship of Yahweh alone, but his efforts were too late and Israel's unfaithfulness caused God to permit the kingdom's destruction by the Neo-Babylonian Empire in the Siege of Jerusalem (587 BCE). However it is now fairly well established among academic scholars that the Biblical narrative is not an accurate reflection of religious views in either Judah or particularly Israel during this period. For the first sixty years, the kings of Judah tried to re-establish their authority over the northern kingdom, and there was perpetual war between them. Israel and Judah were in a state of war throughout Rehoboam's seventeen-year reign. Rehoboam built elaborate defenses and strongholds, along with fortified cities. In the fifth year of Rehoboam's reign, Shishak, pharaoh of Egypt, brought a huge army and took many cities. In the sack of Jerusalem (10th century BCE), Rehoboam gave them all of the treasures out of the temple as a tribute and Judah became a vassal state of Egypt. Rehoboam's son and successor, Abijah of Judah, continued his father's efforts to bring Israel under his control. He fought the Battle of Mount Zemaraim against Jeroboam of Israel and was victorious with a heavy loss of life on the Israel side. According to the books of Chronicles, Abijah and his people defeated them with a great slaughter, so that 500,000 chosen men of Israel fell slain after which Jeroboam posed little threat to Judah for the rest of his reign and the border of the tribe of Benjamin was restored to the original tribal border. Abijah's son and successor, Asa of Judah, maintained peace for the first 35 years of his reign, during which time he revamped and reinforced the fortresses originally built by his grandfather, Rehoboam. 2 Chronicles states that at the Battle of Zephath, the Egyptian-backed chieftain Zerah the Ethiopian and his million men and 300 chariots was defeated by Asa's 580,000 men in the Valley of Zephath near Maresha. The Bible does not state whether Zerah was a pharaoh or a general of the army. The Ethiopians were pursued all the way to Gerar, in the coastal plain, where they stopped out of sheer exhaustion. The resulting peace kept Judah free from Egyptian incursions until the time of Josiah some centuries later. In his 36th year, Asa was confronted by Baasha of Israel, who built a fortress at Ramah on the border, less than ten miles from Jerusalem. The result was that the capital was under pressure and the military situation was precarious. Asa took gold and silver from the Temple and sent them to Ben-Hadad I, king of Aram-Damascus, in exchange for the Damascene king canceling his peace treaty with Baasha. Ben-Hadad attacked Ijon, Dan, and many important cities of the tribe of Naphtali, and Baasha was forced to withdraw from Ramah. Asa tore down the unfinished fortress and used its raw materials to fortify Geba and Mizpah in Benjamin on his side of the border. Asa's successor, Jehoshaphat, changed the policy towards Israel and instead pursued alliances and co-operation with the northern kingdom. The alliance with Ahab was based on marriage. This alliance led to disaster for the kingdom with the battle of Ramoth-Gilead. He then entered into an alliance with Ahaziah of Israel for the purpose of carrying on maritime commerce with Ophir. But the fleet that was then equipped at Ezion-Geber was immediately wrecked. A new fleet was fitted out without the cooperation of the king of Israel, and although it was successful, the trade was not prosecuted. He subsequently joined Jehoram of Israel in a war against the Moabites, who were under tribute to Israel. This war was successful, with the Moabites being subdued. However, on seeing Mesha's act of offering his own son in a human sacrifice on the walls of Kir-haresheth filled Jehoshaphat with horror and he withdrew and returned to his own land. Jehoshaphat's successor, Jehoram of Judah formed an alliance with Israel by marrying Athaliah, the daughter of Ahab. Despite this alliance with the stronger northern kingdom, Jehoram's rule of Judah was shaky. Edom revolted, and he was forced to acknowledge their independence. A raid by Philistines, Arabs and Ethiopians looted the king's house and carried off all of his family except for his youngest son, Ahaziah of Judah. After Hezekiah became sole ruler in c. 715 BCE, he formed alliances with Ashkelon and Egypt, and made a stand against Assyria by refusing to pay tribute. (Isaiah 30–31; 36:6–9) In response, Sennacherib of Assyria attacked the fortified cities of Judah. (2 Kings 18:13) Hezekiah paid three hundred talents of silver and thirty talents of gold to Assyria – requiring him to empty the temple and royal treasury of silver and strip the gold from the doorposts of Solomon's Temple. (2 Kings 18:14–16) However, Sennacherib besieged Jerusalem (2 Kings 18:17) in 701 BCE, though the city was never taken. During the long reign of Manasseh (c. 687/686 – 643/642 BCE), Judah was a vassal of Assyrian rulers – Sennacherib and his successors, Esarhaddon and Ashurbanipal after 669 BCE. Manasseh is listed as being required to provide materials for Esarhaddon's building projects, and as one of a number of vassals who assisted Ashurbanipal's campaign against Egypt. When Josiah became king of Judah in c. 641/640 BCE, the international situation was in flux. To the east, the Neo-Assyrian Empire was beginning to disintegrate, the Neo-Babylonian Empire had not yet risen to replace it, and Egypt to the west was still recovering from Assyrian rule. In this power vacuum, Judah was able to govern itself for the time being without foreign intervention. However, in the spring of 609 BCE, Pharaoh Necho II personally led a sizable army up to the Euphrates to aid the Assyrians. Taking the coast route Via Maris into Syria at the head of a large army, Necho passed the low tracts of Philistia and Sharon. However, the passage over the ridge of hills which shuts in on the south of the great Jezreel Valley was blocked by the Judean army led by Josiah, who may have considered that the Assyrians and Egyptians were weakened by the death of the pharaoh Psamtik I only a year earlier (610 BCE). Presumably in an attempt to help the Babylonians, Josiah attempted to block the advance at Megiddo, where a fierce battle was fought and where Josiah was killed. Necho then joined forces with the Assyrian Ashur-uballit II and together they crossed the Euphrates and lay siege to Harran. The combined forces failed to capture the city, and Necho retreated back to northern Syria. The event also marked the disintegration of the Assyrian Empire. On his return march to Egypt in 608 BCE, Necho found that Jehoahaz had been selected to succeed his father, Josiah. Necho deposed Jehoahaz, who had been king for only three months, and replaced him with his older brother, Jehoiakim. Necho imposed on Judah a levy of a hundred talents of silver (about 3​3⁄4 tons or about 3.4 metric tons) and a talent of gold (about 34 kilograms (75 lb)). Necho then took Jehoahaz back to Egypt as his prisoner, never to return. Jehoiakim ruled originally as a vassal of the Egyptians, paying a heavy tribute. However, when the Egyptians were defeated by the Babylonians at Carchemish in 605 BCE, Jehoiakim changed allegiances, paying tribute to Nebuchadnezzar II of Babylon. In 601 BCE, in the fourth year of his reign, Nebuchadnezzar unsuccessfully attempted to invade Egypt and was repulsed with heavy losses. This failure led to numerous rebellions among the states of the Levant which owed allegiance to Babylon. Jehoiakim also stopped paying tribute to Nebuchadnezzar and took a pro-Egyptian position. Nebuchadnezzar soon dealt with these rebellions. According to the Babylonian Chronicles, after invading "the land of Hatti (Syria/Palestine)" in 599 BCE, he lay siege to Jerusalem. Jehoiakim died in 598 BCE during the siege, and was succeeded by his son Jeconiah at an age of either eight or eighteen. The city fell about three months later, on 2 Adar (March 16) 597 BCE. Nebuchadnezzar pillaged both Jerusalem and the Temple, carting all his spoils to Babylon. Jeconiah and his court and other prominent citizens and craftsmen, along with a sizable portion of the Jewish population of Judah, numbering about 10,000 were deported from the land and dispersed throughout the Babylonian Empire. (2 Kings 24:14) Among them was Ezekiel. Nebuchadnezzar appointed Zedekiah, Jehoiakim's brother, king of the reduced kingdom, who was made a tributary of Babylon. Despite the strong remonstrances of Jeremiah and others, Zedekiah revolted against Nebuchadnezzar, ceasing to pay tribute to him and entered into an alliance with Pharaoh Hophra. In 589 BCE, Nebuchadnezzar II returned to Judah and again besieged Jerusalem. During this period, many Jews fled to surrounding Moab, Ammon, Edom and other countries to seek refuge. The city fell after a siege which lasted either eighteen or thirty months and Nebuchadnezzar again pillaged both Jerusalem and the Temple, after which he destroyed them both. After killing all of Zedekiah's sons, Nebuchadnezzar took Zedekiah to Babylon, putting an end to the independent Kingdom of Judah. According to the Book of Jeremiah, in addition to those killed during the siege, some 4,600 people were deported after the fall of Judah. By 586 BCE much of Judah was devastated, and the former kingdom suffered a steep decline of both economy and population. Jerusalem apparently remained uninhabited for much of the 6th century, and the centre of gravity shifted to Benjamin, the relatively unscathed northern section of the kingdom, where the town of Mizpah became the capital of the new Babylonian province of Yehud for the remnant of the Jewish population in a part of the former kingdom. This was standard Babylonian practice: when the Philistine city of Ashkelon was conquered in 604 BCE, the political, religious and economic elite (but not the bulk of the population) was banished and the administrative centre shifted to a new location. Gedaliah was appointed governor of the Yehud Medinata, supported by a Babylonian guard. The administrative centre of the province was Mizpah in Benjamin, not Jerusalem. On hearing of the appointment, many of the Judeans that had taken refuge in surrounding countries were persuaded to return to Judah. However, before long Gedaliah was assassinated by a member of the royal house, and the Chaldean soldiers killed. The population that was left in the land and those that had returned fled to Egypt fearing a Babylonian reprisal, under the leadership of Yohanan ben Kareah, ignoring the urging of the prophet Jeremiah against the move. (2 Kings 25:26, Jeremiah 43:5–7) In Egypt, the refugees settled in Migdol, Tahpanhes, Noph, and Pathros, (Jeremiah 44:1) and Jeremiah went with them as a moral guardian. The numbers that were deported to Babylon and those who made their way to Egypt and the remnant that remained in the land and in surrounding countries is subject to academic debate. The Book of Jeremiah reports that 4600 were exiled to Babylonia. The Books of Kings suggest that it was ten thousand, and later eight thousand. In 539 BCE the Achaemenid Empire conquered Babylonia and allowed the exiles to return to Yehud Medinata and rebuild the Temple, which was completed in the sixth year of Darius (515 BCE) (Ezra 6:15) under Zerubbabel, the grandson of the second to last king of Judah, Jeconiah. Yehud Medinata was a peaceful part of the Achaemenid Empire until the fall of the Empire in c. 333 BCE to Alexander the Great. ^ Grabbe, Lester L., ed. (2008). Israel in Transition: From Late Bronze II to Iron IIa (c. 1250–850 B.C.E.). A&C Black. pp. 225–226. ISBN 978-0567027269. Retrieved 12 October 2018. ^ Vaughn, Andrew G.; Killebrew, Ann E., eds. (2003). Jerusalem in Bible and Archaeology: The First Temple Period. Society of Biblical Literature. p. 149. ISBN 9781589830660. Retrieved 12 October 2018. ^ Finkelstein, Israel (2006). Amit, Yairah; Ben Zvi, Ehud; Finkelstein, Israel; Lipschits, Oded, eds. The Last Labayu: King Saul and the Expansion of the First North Israelite Territorial Entity. Essays on Ancient Israel in Its Near Eastern Context: A Tribute to Nadav Na'aman. Eisenbrauns. p. 179. ISBN 9781575061283. Retrieved 12 October 2018. ^ a b Finkelstein, Israel; Silberman, Neil Asher (2001). The Bible Unearthed: Archaeology's New Vision of Ancient Israel and the Origin of Sacred Texts. The Free Press. pp. 240–243. ISBN 9780743223386. ^ a b c d Mazar, Amihai. "Archaeology and the Biblical Narrative: The Case of the United Monarchy". Pp. 29-58 In: One God – One Cult - One Nation. Archaeological and Biblical Perspectives, Edited by Reinhard G. Kratz and Hermann Spieckermann in Collaboration with Björn Corzilius and Tanja Pilger, (Beihefte zur Zeitschrift für die Alttestamentliche Wissenschaft 405), Berlin/ New York. Retrieved 12 October 2018. ^ Moore & Kelle 2011, p. 302. ^ Ben-Sasson, Haim Hillel, ed. (1976). A History of the Jewish People. Harvard University Press. p. 142. ISBN 9780674397316. Retrieved 12 October 2018. Sargon's heir, Sennacherib (705–681), could not deal with Hezekiah's revolt until he gained control of Babylon in 702. ^ Rollston, Chris A. (2010). Writing and Literacy in the World of Ancient Israel: Epigraphic Evidence from the Iron Age. Society of Biblical Literature. pp. 53–54. ISBN 9781589831070. Retrieved 12 October 2018. ^ Katz 2015, p. 27. ^ Holloway, Steven W.; Handy, Lowell K., eds. (1995). The Pitcher is Broken: Memorial Essays for Gösta W. Ahlström. Bloomsbury Publishing. ISBN 9780567636713. Retrieved 12 October 2018. 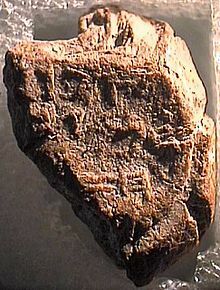 For Israel, the description of the battle of Qarqar in the Kurkh Monolith of Shalmaneser III (mid-ninth century) and for Judah, a Tiglath-pileser III text mentioning (Jeho-) Ahaz of Judah (IIR67 = K. 3751), dated 734-733, are the earliest published to date. ^ Shtull-Trauring, Asaf (6 May 2011). "The keys to the Kingdom". Haaretz. ...an important group of archaeologists and biblical scholars formed the view that in reality the kingdom of David and Solomon bore little resemblance to the biblical portrait of an extensive, powerful, united monarchy. This view derives primarily from the fact that no 10th century BCE archaeological finds exist that could corroborate claims of the existence of a magnificent biblical kingdom extending from Be'er Sheva in the south to Dan in the north. Accordingly, these scholars and archaeologists conclude that the so-called kingdom was no more than a small tribal entity, meager in substance and sparse in population, which did not extend beyond the boundaries of Jerusalem and its immediate surroundings. ^ Moore, Megan Bishop; Kelle, Brad E. (17 May 2011). Biblical History and Israel's Past: The Changing Study of the Bible and History. Wm. B. Eerdmans Publishing. ISBN 9780802862600. Retrieved 12 October 2018. ^ Pileggi, Tamar (12 April 2016). "New Look at Ancient Shards Suggests Bible Even Older than Thought." Times of Israel. Retrieved from TimesofIsrael.com, 30 January 2019. ^ Handy, Lowell K. (1995). "The Appearance of Pantheon in Judah". In Edelman, Diana Vikander. The Triumph of Elohim. Grand Rapids, Michigan: W. B. Eerdmans. p. 27. Retrieved 12 October 2018. ^ a b Leithart, Peter J. (2006). 1 & 2 Kings (Brazos Theological Commentary on the Bible). Baker Publishing Group. pp. 255–256. ISBN 9781441235602. Retrieved 12 October 2018. ^ James B. Pritchard, ed., Ancient Near Eastern Texts Related to the Old Testament (Princeton, NJ: Princeton University Press, 1965) 287–88. ^ a b Thiele, Edwin (1951). The Mysterious Numbers of the Hebrew Kings (1st ed.). New York: Macmillan. ISBN 978-0-8254-3825-7. ^ a b Bright, John (2000). A History of Israel. Westminster John Knox Press. p. 311. ISBN 9780664220686. Retrieved 12 October 2018. Coogan, Michael David (2001). The Oxford History of the Biblical World. Oxford University Press. p. 261. ISBN 9780195139372. Retrieved 12 October 2018. ^ Rollinson, Dr. "The Divided Monarchy - ca. 931 - 586 BC". Retrieved 12 October 2018. ^ Wigoder, Geoffrey (2006). The Illustrated Dictionary & Concordance of the Bible. by Sterling Publishing Company, Inc.
^ Cohn-Sherbok, Dan (1996). The Hebrew Bible. Continuum International. p. x. ISBN 978-0-304-33703-3. ^ Vincent, Sr., Robert Benn. "Daniel and the Captivity of Israel". Retrieved 12 October 2018. ^ King, Philip J. (1993). Jeremiah: An Archaeological Companion. Westminster John Knox Press. p. 23. ^ Malamat, Abraham (1968). "The Last Kings of Judah and the Fall of Jerusalem: An Historical – Chronological Study". Israel Exploration Journal. 18 (3): 137–156. JSTOR 27925138. The discrepancy between the length of the siege according to the regnal years of Zedekiah (years 9–11), on the one hand, and its length according to Jehoiachin's exile (years 9–12), on the other, can be cancelled out only by supposing the former to have been reckoned on a Tishri basis, and the latter on a Nisan basis. The difference of one year between the two is accounted for by the fact that the termination of the siege fell in the summer, between Nisan and Tishri, already in the 12th year according to the reckoning in Ezekiel, but still in Zedekiah's 11th year which was to end only in Tishri. ^ a b Grabbe, Lester L. (2004). A History of the Jews and Judaism in the Second Temple Period. T&T Clark International. p. 28. ISBN 978-0-567-08998-4. ^ Davies, Philip R. (2009). "The Origin of Biblical Israel". Journal of Hebrew Scriptures. 9 (47). Archived from the original on 28 May 2008. Retrieved 12 October 2018. ^ Lipschitz, Oded (2005). The Fall and Rise of Jerusalem. Eisenbrauns. p. 48. ISBN 9781575060958. ^ Sweeney, Marvin A. (2010). The Prophetic Literature: Interpreting Biblical Texts Series. Abingdon Press. ISBN 9781426730030. Wikimedia Commons has media related to Kingdom of Judah. Albertz, Rainer (1994) [Vanderhoek & Ruprecht 1992]. A History of Israelite Religion, Volume I: From the Beginnings to the End of the Monarchy. Westminster John Knox Press. ISBN 9780664227197. Albertz, Rainer (1994) [Vanderhoek & Ruprecht 1992]. A History of Israelite Religion, Volume II: From the Exile to the Maccabees. Westminster John Knox Press. ISBN 9780664227203. Albertz, Rainer (2003a). Israel in Exile: The History and Literature of the Sixth Century B.C.E. Society of Biblical Literature. ISBN 9781589830554. Becking, Bob (2003b). "Law as Expression of Religion (Ezra 7–10)". Yahwism After the Exile: Perspectives on Israelite Religion in the Persian Era. Koninklijke Van Gorcum. ISBN 978-9023238805. Davies, Philip R. "The Origin of Biblical Israel". Retrieved 14 February 2015. Barstad, Hans M. (2008). History and the Hebrew Bible. Mohr Siebeck. ISBN 9783161498091. Bedford, Peter Ross (2001). Temple Restoration in Early Achaemenid Judah. Brill. ISBN 978-9004115095. Ben-Sasson, H.H. (1976). A History of the Jewish People. Harvard University Press. ISBN 978-0-674-39731-6. Blenkinsopp, Joseph (1988). Ezra-Nehemiah: A Commentary. Eerdmans. Blenkinsopp, Joseph (2003). "Bethel in the Neo-Babylonian Period". In Oded Lipschitz; Joseph Blenkinsopp. Judah and the Judeans in the Neo-Babylonian Period. Eisenbrauns. ISBN 978-1575060736. Blenkinsopp, Joseph (2009). Judaism, the First Phase: The Place of Ezra and Nehemiah in the Origins of Judaism. Eerdmans. Brett, Mark G. (2002). Ethnicity and the Bible. Brill. Davies, Philip R. (1992). In Search of Ancient Israel. Sheffield. ISBN 9781850757375. Davies, Philip R. (2009). "The Origin of Biblical Israel". Journal of Hebrew Scriptures. 9 (47). Archived from the original on 2008-05-28. Dever, William (2001). What Did the Biblical Writers Know, and When Did They Know It?. Eerdmans. ISBN 9780802821263. Dever, William (2003). Who Were the Early Israelites and Where Did They Come From?. Eerdmans. ISBN 9780802809759. Dever, William (2017). Beyond the Texts: An Archaeological Portrait of Ancient Israel and Judah. SBL Press. Finkelstein, Israel; Silberman, Neil Asher (2001). The Bible Unearthed. ISBN 9780743223386. Finkelstein, Israel; Mazar, Amihay; Schmidt, Brian B. (2007). The Quest for the Historical Israel. Society of Biblical Literature. ISBN 9781589832770. Golden, Jonathan Michael (2004a). Ancient Canaan and Israel: An Introduction. Oxford University Press. ISBN 9780195379853. Golden, Jonathan Michael (2004b). Ancient Canaan and Israel: New Perspectives. ABC-CLIO. ISBN 9781576078976. Katz, Reinhard Gregor (2015). Historical and Biblical Israel. Oxford University Press. Killebrew, Ann E. (2005). Biblical Peoples and Ethnicity: An Archaeological Study of Egyptians, Canaanites, and Early Israel, 1300–1100 B.C.E. Society of Biblical Literature. ISBN 9781589830974. King, Philip J.; Stager, Lawrence E. (2001). Life in Biblical Israel. Westminster John Knox Press. ISBN 978-0-664-22148-5. Kuhrt, Amélie (1995). The Ancient Near East c. 3000–330 BC. Routledge. Levy, Thomas E. (1998). The Archaeology of Society in the Holy Land. Continuum International Publishing. Middlemas, Jill Anne (2005). The Troubles of Templeless Judah. Oxford University Press. Miller, James Maxwell; Hayes, John Haralson (1986). A History of Ancient Israel and Judah. Westminster John Knox Press. ISBN 978-0-664-21262-9. Pitkänen, Pekka (2004). "Ethnicity, Assimilation and the Israelite Settlement" (PDF). Tyndale Bulletin. 55 (2): 161–82. Archived from the original (PDF) on 2011-07-17. Soggin, Michael J. (1998). An Introduction to the History of Israel and Judah. Paideia. ISBN 9780334027881. Van der Toorn, Karel (1996). Family Religion in Babylonia, Syria, and Israel. Brill. ISBN 978-9004104105. Zevit, Ziony (2001). The Religions of Ancient Israel: A Synthesis of Parallactic Approaches. Continuum. ISBN 9780826463395.